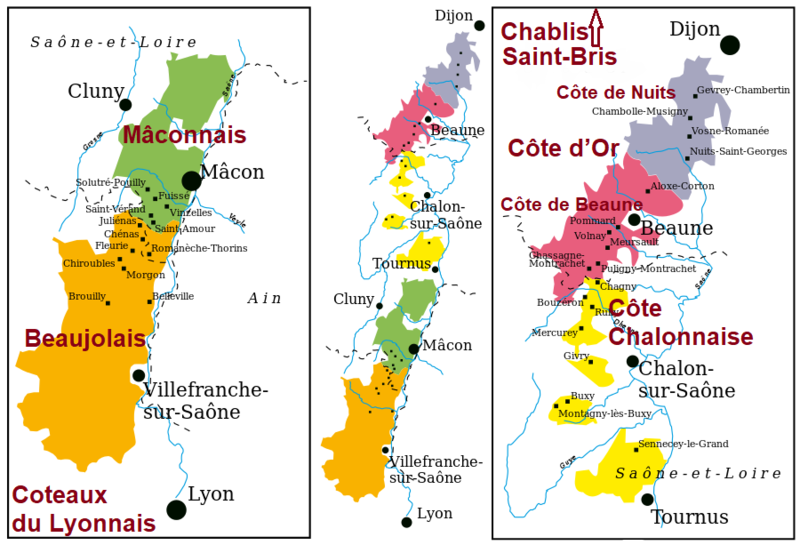 In the northern part Côte de Nuits is mainly full-bodied and long-storable red wine produced from the dominant here Pinot Noir. A total of 22 of the 23 red Grand Crus of Burgundy originate from here. The subsoil consists of sandy limestone, which is covered in higher layers with chalky, mixed with marl and clay scree. In lower elevations, nutrient-rich soils prevail. There are long, cold winters, rain in the spring and hot, sunny summers. The relatively common one here hail is particularly dreaded. The most important appellations are Chambolle-Musigny. Côte de Nuits-Villages. Fixin. Gevrey-Chambertin. Marsannay. Morey-Saint-Denis. Nuits-Saint-Georges. Vosne-Romanée (with famous winery Domaine de la Romanée-Conti ) and Vougeot (with historic Grand Cru location Clos de Vougeot ). At the Château de Vougeot has the famous Burgundian Brotherhood Confrérie des Chevaliers du Tastevin your seat. This page was last modified at 5 May 2018 at 09:48.